Bradley Good grew up in Los Angeles, California. After obtaining a bachelor’s degree from UC Berkeley and an MBA and a Masters degree in East Asian Studies from the University of Chicago, he worked at Booz Allen and A.T. Kearney to consult with companies throughout Asia. Brad also was the CEO of OurGroup Inc., an online platform for groups and causes. Brad speaks fluent mandarin Chinese, has a fourth degree black belt in karate, and has guest lectured at various universities. Bradley Good's 113 Days is the memoir of a successful businessman who got broken, losing everything and finding himself in tight places in Beijing as he becomes bipolar. Follow his story as he hits a devastating moment in his life, getting jailed for 113 days in Los Angeles County Jail. Will he be able to survive when his own father went down? It’s a story of how losing everything can lead to finding the most essential thing. This is a book about grit, about facing adversity, and about what losing everything can mean. The author allows readers to see his vulnerability as he is stripped of everything, submitted to the harshest conditions. The story begins with a powerful reflection on suicide where the author evokes how his father took his own life and makes an allusion to Ernest Hemingway, who took his life too. One can’t understand why a man as gifted as Hemingway would commit suicide, and why a man like the author’s father, an intelligent man who graduated from medical school with an award, would do the same. The prose is exceptionally good and perceptive, taking readers into the mind of the author and allowing them to navigate the emotional turmoil that follows him after his great loss. The narrative is focused and filled with reflections on life, on finding meaning, on survival, and on beating adversity. One has the feeling the author listened well to his pain and became familiar with it, which is why he trumped it easily. Bradley Good's 113 Days is written in an evocative style; it is thought provoking and enjoyable. While the prose and the storytelling skills of Bradley Good are exceptional, it is the message of this book that will move readers. 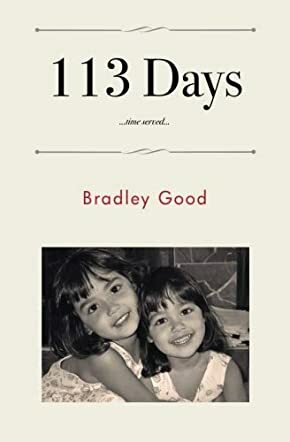 Bradley Good's 113 Days is the moving memoir of a successful businessman who finds himself in Los Angeles County Jail, accused of two counts of assault with a deadly weapon and one count of vandalism. The son of a doctor and an artist, Bradley had a privileged childhood. He meets Cora, a young Korean medical student, and falls in love with her but, as fate would have it, they part ways. After graduation, he pursues a career that takes him to China and other parts of Asia, where he meets a Burmese American woman who becomes his wife. Returning to the US, the couple has two beautiful daughters and Bradley starts a business. It seems like he's leading the good life but things will take a completely different path, especially when his father commits suicide and he bumps into his old love. As the title suggests, Bradley Good's 113 Days is an account of the days he spent in Los Angeles County Jail and between the recounting of the regular routine of prison life, he gives us glimpses of his personal life. And in so doing, he opens his heart and soul to the reader. Bradley Good is bipolar and so are 8.5 million Americans but it is, arguably, the most misunderstood mental illness in our midst. Bradley Good's 113 Days unravels slowly and the pace quickens as we leaf through its pages. And in the end a poignant tale of survival, courage and inspiration reveals itself. Surprisingly, one does not have to be a bipolar to be able to relate to the characters of this story. Indeed, this is a treasure of a book that should inspire everyone and give hope to those who are bipolar, their family and friends. You know what can be scary? Not criminal insanity itself (a kind of alternative, virtual reality for the sufferer,) but the mild kind of insanity diagnosed as Bi-polar Disorder that may lead to criminal indictment even as you remain unaware you have it. Bradley Good describes this horror in his immensely detached yet truly frightening account, 113 Days. Early on, the reader may be apathetic, as Mr. Good’s apparent self-regard may strike one as too self-absorbed and too blaming of others for his inordinately frequent, life-obstructing predicaments. My advice: bear with him. Engage your instinct to give him “the benefit of the doubt.” The apparent normality Mr. Good conveys is meant to show exactly how elusive is one’s ability to assess his own mental health. Stability of mind can be fragile, as Bradley Good demonstrates so perfectly in his reflective book, 113 Days. It can alter gradually enough to defy easy detection. Like a frog in boiling water: something is different, but what? The scariest part of Mr. Good’s truly enthralling account is the one titled 11 Days in Beijing, where a homeless and financially destitute narrator wanders the Chinese city, unaware that his faculties are failing, that his perceptions are paranoid and misleading, that people are desperately worried for his safety, and yet he believes everything is normal despite the occasional memory lapse, like 'where did I leave all of my possessions?' By the time Mr. Good is indicted in the United States for felony assault, only by fluke does he get diagnosed and treated. His 113 days in jail mirror similar accounts of those assigned to hell. But true hell is not knowing you’re not quite sane. Bradley Good makes you live this hell, and it is truly scary, until redemption. What does it really mean to hit rock bottom, to arrive a point where suicide becomes an option? But then, what is the secret of rising after a devastating fall? In 113 Days, Bradley Good, a successful businessman, loses everything and is driven to the edge of insanity, expressing bipolar symptoms in Beijing and subsequently getting himself jailed for 113 days. This memoir shares his pain with readers and allows them to see his different, somewhat disturbing experiences, and find out what makes him rise up from the ashes. This is the painful tale of a man who has been arrested for a hit and run, for desecrating a church, for defrauding an innkeeper, and how losing everything turned his life around. This is a very moving story and although it is the journey of loss and the miracle of love, it is also the painful tale of many readers. I enjoyed the simplicity in the writing and the sincere narrative voice. I loved the way this author writes about prison and the way he looks at the human condition. He succeeds in making the narrative light by enriching it with humor — at times grim. Whether he is talking about taking the bus from “hell” to the courthouse, chained with criminals, or the surprise when the police come up to him in the lobby and soon he is in handcuffs, there is a hilarity about it that makes it enjoyable. Good's 113 Days is filled with insightful passages and powerful lessons on inner freedom, survival, and personal growth. This book explains in an intelligent way why the author didn’t commit suicide like his father. Bradley Good’s writing is both entertaining and inspirational. Bradley Good's 113 Days is an autobiography outlining a dark period in the author's life, and the series of events that led up to it. Good begins with the misdiagnosis of cancer in his father, resulting in the removal of ribs that left him so physically handicapped he lost all will to live in a debilitating condition and committed suicide. Following that death, Good is given letters he'd written to his father during the years the author lived in Asia, chronicling a spiral downward, fuelled by bipolar disorder, that culminated in months served at a Los Angeles jail and Good's eventual struggle to reclaim control over his life. Bradley Good's 113 Days is an inspiring story of a man's perseverance despite a medical condition and family history that, by all appearances, may likely have led to the same outcome as his father. Writing in the first person, Good does an excellent job of weaving between time spent in jail and his backstory, allowing for a fluidity of storytelling that provides an intriguing launchpad, diving in head first and stroking through the journey with perfectly paced, rhythmic laps. The depictions of his own mental illness and its rapid progression toward the loss of absolutely everything Good had - including his own family - are heartbreaking. Even so, Good writes and reminisces with a positive energy that underscores strength and fortitude, the very attributes that embody a man who had the ability not just to survive, but persevere, reclaiming his life so that he might be able to share his story with the world.